♦ The point-to-point service requires a 24-hour advance reservation; and a return trip can be reserved at the same time. Call (229) 567-3400 for reservations. ♦ The cost for a one-way trip is $3.00 cash for trips under 10 miles and $3.00 + 50¢ per mile for trips over 10 miles. Please try to have exact change. Credit or Debit cards are not accepted. The driver has a Passenger Log and records who rides the van when the fare is paid. ♦ Turner Transit System Vans carry 12 passengers and are equipped with a wheelchair lift. The service is curb to curb, and the van will wait no longer than 5-minutes if the passenger is not present. ♦ Smoking, alcoholic beverages, or illegal drugs are not allowed on the vans. No eating, drinking or open food containers are allowed. ♦ Adults must accompany children under 12, and children under 4 must be in a car seat. All passengers must be seated and wear seat belts while the van is in operation. 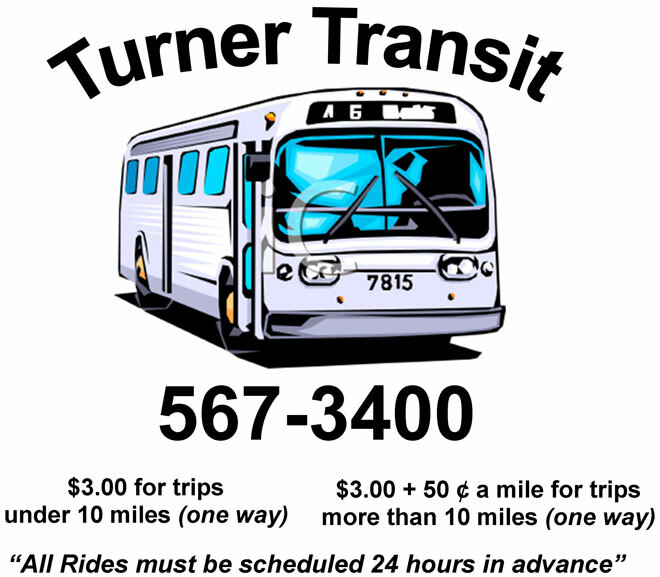 The Turner Transit System also provides contract shuttle service to and from Senior Centers, nursing homes, health care facilities, hospitals, and doctor’s offices; as well as for shopping and excursions. Businesses interested in providing contract shuttle service for their employees going to and from their workplace should call (229) 732-2291. Purchase of service contracts are negotiated on an individual basis. The Turner County Transit System's current and long-term focus as a transportation provider is on maintaining the best-coordinated transportation system possible for this community. Our goal is to create a coordinated system with the objective of providing safe, reliable, timely and efficient transportation services to county residents; fully compliant with regulatory requirements; at the minimum cost to the County and its citizens. The Turner Transit System operates its programs and services without regard to race, color, and national origin in accordance with Title VI of the Civil Rights Act. Any person who believes she or he has been aggrieved by any unlawful discriminatory practice under Title VI may file a complaint with The Turner Transit System. For more information on The Turner Transit System’s civil rights program, and the procedures to file a complaint, contact (229) 567-4313, (TTY 866-694-5824); lwilson@turnercountygeorgia.com; or visit our administrative office at 208 E College Ave, Ashburn, GA 31714. For more information, visit www.turnercountygeorgia.com. If information is needed in another language, contact (229) 567-4313. La sistema de tránsito de Turner opera sus programas y servicios, sin distinción de raza, color y origen nacional, de conformidad con el Título VI del Acta de Derechos Civiles. Cualquier persona que cree que él o ella ha sido agraviada por cualquier práctica discriminatoria ilegal bajo el Título VI, puede presentar una queja con el sistema de transporte Turner. Para obtener más información sobre la programa de derechos civiles de La sistema de tránsito de Turner, y los procedimientos para presentar una queja, contacte a (229) 567-4313, (TTY 866-694-5824); email lwilson@turnercountygeorgia.com; o visite nuestra oficina administrativa en 208 E College Ave, Ashburn, GA 31714. Para obtener más información, visite www.turnercountygeorgia.com. Si se necesita información en otro idioma, el contacto (229) 567-4313.